PHANTASMAGORY was found late in 1991 by V. Vorobyov on drums and S. Pogrebnoy on vocals. With time some new members joined them. They were S. Kalyuzha (bass), D. Titula (guitars), V. Kizilov (guitars, R.I.P.) Now line-up was formed completely and a work over the debut material has begun. By the way, there was a time when the band was playing melodic death/doom and it was called DEATH SENTENCE. After lots of performances the band attained cult status in its region, and after playing at the legendary all-Ukrainian festival, “Chervona Ruta” in 1995, they wan the 2-nd prize in metal category. However, during that year the band was struck with the tragedy - Vitaliy Kizilov passed away. The band stopped all the activity and broke up. 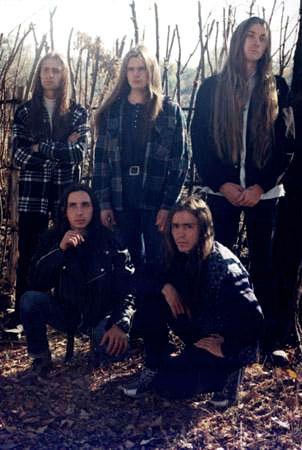 In mid ’96 Vorobyov and Pogrebnoy struggled for reforming the band with new members E. Miroshnichenko (guitar), B. Baklitsky (bass, ex-EPITAPH) and V. Klimets (keyboards, ex-THE ASH). First of all they changed the name in PHANTASMAGORY that meant the new beginning and direction for the group. They managed to create something surreal, amorphous with a death metal sound. In 1997 they recorded their debut demo “Phantasmagoria” which consisted of 7 songs (approx.32 mins.) and was recorded in eight track digital studio. It was self-released in tape-format. All the underground reviews made it clear that the band played something new and original, so they recognized the band as “progressive technical death.” After the released debut, there were filmed some videos and performed lots of concerts. In the early 1999 the band started working over its new creation “Odd Sounds” The band took a huge step forward musically, if one would compare it with their debut. This time the album was recorded in a sixteen track digital studio and consisted of seven tracks (approx.50 mins.). “Odd Sounds” has been released in tape-format by Moon Records (Ukraine) and in tape- and CDR-formats by The Flaming Arts (Belarus). Unfortunately, the band have never seen those CDs, ‘cause that label couldn’t find the factory which would be able to press CDs themselves. Despite this problem, there has been sold more than 3 thousand copies of the album. The reaction of mass-media and fans was just fantastic, but after the releasing “Odd Sounds” Klimets, Pogrebnoy and Balitsky have left the band. It was only the question of time about their disbanding. Only with the great efforts Vorobyov and Miroshnichenko, have found the new musicians M. Zamai (keyboards) and V. Kornienko (bass, ex-COSMOZOO, CHAOS, SAHARA). Almost for a year they have been tried to find the new singer, but with no success. Finally S. Pogrebnoy has returned to the band. Now, with a new line-up, band has recorded the last album in their history “Anamorphosis Of Dreams” - Progressive Death/Jazz/Black Metal - MUSIC of heavenly spheres which ATHEIST or CYNIC had played if they would have been existed! Unfortunately, in early spring of 2002 the band broke up till the end of the days. Nowadays only few former members of PHANTASMAGORY continue their musical activity. V. Kornienko plays in COSMOZOO and YOGA. In the same band M. Zamai plays. E. Miroshnichenko, ex-mastermind of PHANTASMAGORY prepares a project with new members. Now it’s a band DISILENCE. The band is influenced greatly with the new EMPEROR, ATROX, ZYCLON and, of course, PHANTASMAGORY. In the spring of 2003 E. Miroshnichenko has signed a deal with russian metal label STYGIAN CRYPT Productions for releasing of “Anamorphosis Of Dreams” in CD-format. Album was released in june 2003 with professional 8-pages colored booklet with phantasmagoric pictures and lyrics.